He was the Champions League hero who arrived promising an exciting brand of football, but Ole Gunnar Solskjaer's tenure at Cardiff City will be remembered as a failure. The former Manchester United striker, best known for his winning goal against Bayern Munich in the 1999 Champions League final, arrived with great fanfare in January 2014. 2014: Appointed Cardiff boss in January but fails to help them avoid relegation. Steps down as manager after less than nine months in charge. He presented a different vision for Cardiff compared with the defensive approach of his predecessor Malky Mackay, renowned for an unspectacular, yet effective style that gained the club promotion to the Premier League in 2013. Mackay's success meant popularity with fans and that probably didn't help Solskjaer's cause. The Scot's bitter falling-out with the club's Malaysian owner Vincent Tan had disillusioned many supporters who saw Mackay's sacking as a regression for a club who had fought so hard for a top-flight return after half a century away. He may have promised a more exciting style, but under Solskjaer the Bluebirds slipped into the Premier League's bottom three for the first time and never recovered, finishing bottom. The results were shocking - 3-0 at Swansea, 6-3 against Liverpool, 3-0 defeats against Crystal Palace and Newcastle and 4-0 losses to Hull and Sunderland. Tan blamed Mackay for relegation, which was confirmed at the penultimate game of the season, and expected a swift Premier League return under the Norwegian. And so began a big recruitment drive in the summer. Nine players came in, many of Mackay's men left, but it seemed even with so many new faces Solskjaer didn't know what his best team was. He named a different starting 11 for all of the games he oversaw this season and his tinkering was deemed to have had an adverse effect on results. Two home defeats in succession, against Norwich and Middlesbrough, sealed his fate. The nature of the capitulation against the Canaries caused particular concern, Cardiff leading 2-0 before conceding four second-half goals to lose 4-2. During the 1-0 loss against Boro four days later, the Cardiff crowd vented their frustration at the Norwegian, booing him as he tried to get the ball to one of his players to take a throw-in. After the game the Norwegian said he accepted the blame for the club's poor run of form. "I'm responsible and I should get better results than we've had in the first seven games," said Solskjaer, who seems to have the ability to remain upbeat in the most trying of circumstances. The manager may be responsible for the team but many feel the board, and particularly owner Vincent Tan, have to take some responsibility too. 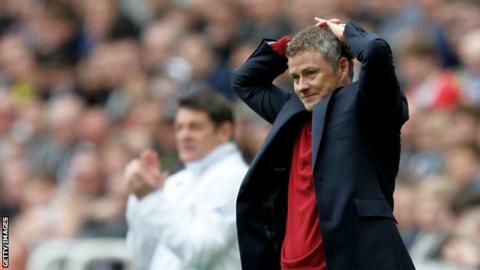 "It was the wrong appointment for Cardiff and the wrong club for Solskjaer," said former Cardiff captain Jason Perry on BBC Radio Wales. "Do we know how Cardiff City play? No. "I think only four players played against Blackburn [in the Championship opener] that played against Middlesbrough. He picked a different back four yet again. "If you're manager or a coach you have a central strategy and you work on that." Solskjaer will not have the chance to find a strategy that works and attention now turns to the next man to work under Tan. Early favourites include Welshman Tony Pulis, who would be popular with fans given the job he did at Crystal Palace last season, and Dundee's Paul Hartley, who has overseen his club's rise to the Scottish Premiership. Things are rarely dull at Cardiff City. Whoever takes charge will discover that.